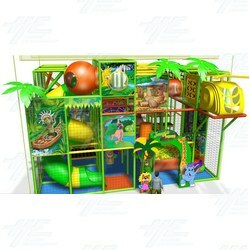 This 3D Softplay Jungle Gym set is perfect for start up Family Entertainment Centres, with loads of fun features, kids of all ages will love playing around on this super safe and reliable equipment. The jungle gym is super padded to make sure kids are safe as they jump and run and climb everywhere! It also has loads of fun features for kids to enjoy, such as multiple slippery slides, a big ball pit, fun (and safe!) obstacles for kids to climb through and around, a big Naughts and Crosses game, and loads of hidey-holes and tunnels! The equipment is very colourful and will stand out in any location and features amazing, brightly coloured jungle-themed artwork to be enjoyed! The large size of the equipment does mean this is most appropriate for Family Entertainment Centers with lots of space. Parents will enjoy sitting back as the kids run wild in a this plush, 3D softplay Jungle Gym set, with it's bright artwork and multiple levels to explore and play on, this indoor attraction will draw in kids from all across the floor. The jungle gym is super padded to make sure kids are safe as they jump and run and climb everywhere! It also has loads of fun features for kids to enjoy, such as multiple slippery slides, a big ball pit, fun (and safe!) obstacles for kids to climb through and around, a big Naughts and Crosses game, and loads of hidey-holes and tunnels! The equipment is very colourful and will stand out in any location and features amazing, brightly coloured jungle-themed artwork to be enjoyed! The large size of the equipment does mean this is most appropriate for Family Entertainment Centers with lots of space. Parents will enjoy sitting back as the kids run wild in a this plush, 3D softplay Jungle Gym set, with it's bright artwork and multiple levels to explore and play on, this indoor attraction will draw in kids from all across the floor.